14 oz Cotton Canvas Seating and 2 ply back. 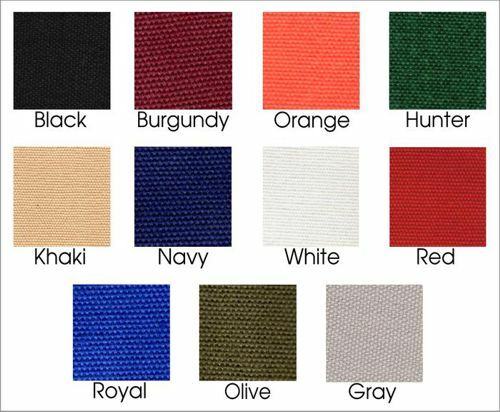 We use a special 2 piece canvas that allows for direct embroidery of one or 2 sides and hides the ugly underside of embroidery. Traditionally the 2nd line is embroidered slightly smaller than the top or line 2. You may specify size relation in the comments or notes section if you choose. Fits Gold Medal Director Chair "Round Stick"
Enter Text EXACTLY as you want it printed. Please take time to view font styles before ordering. Most Script or cursive fonts DO NOT LOOK GOOD AS ALL CAPS! Proofs: Pre-production proofs are available with purchase for an additional charge. A pre-production proof means that we will set up your order as specified in your choices, including font styles, Font case (UPPER, lower or Upper and Lower) that is determined by the way you type in your text, canvas color and thread color. Please note that choosing a pre-production proof will delay production by at least 1 day and production will not begin until you have viewed and approved the proof for production. Each additional day that you do not respond to the proof will delay the production by the same number of days. Keep this in mind if you have a deadline or an expected date for delivery. Delays in approval = delays in production. Production Times: Orders are filled in the order in which they are received. The normal production time for a custom decorated item is estimated at 5-7 business days. Depending on our current order volume orders can be filled slightly faster or slightly slower as volume dictates. If you have a time sensitive need we do offer RUSH PRODUCTION SERVICES. 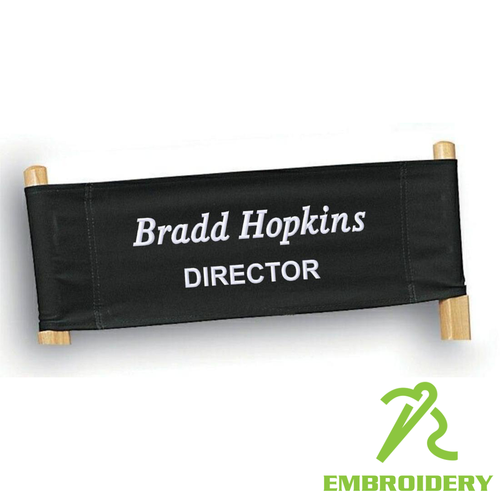 RUSH SERVICE: If you have a time sensitive need for one of custom decorated director chairs, we offer RUSH PRODUCTION SERVICES. If you choose a RUSH PRODUCTION SERVICE we will produce your order with priority even if overtime is required for our staff to complete your order. There are additional charges for these rush services. Please note that rush production is different than Expedited or Rushed Shipping Methods. You may choose the appropriate shipping method at checkout. Shipping Service: We do offer upgraded UPS shipping services if items are needed quickly. Normal UPS delivery times vary depending on where you are located and can take 1-7 business days. Shipping offered to the US only. Question: Can I purchase only the seat part (or only the back part) and not purchase the back (Seat), I already have the back or seat. Answer: No. We purchase these items in sets only from the manufacturer and sell them only in sets. Also, please understand that the dying process can vary slightly from batch to batch and a new seat or back may not match your back or seat exactly, but the set that we sell you will match together.